For over 8 years I was US #1 with a commanding lead, achieving much of the Olympic dream by becoming a United States Olympian and we did that together. But going into the 2012 trials I lost with a board broken in half by Malaysian Airways. There is no one to solace you for losing the trials. This year I was back on the national team and finished 4th at the trials for Rio, very satisfied because I work a full time job and really love what I do. But there is another Olympic race far more difficult than becoming an Olympian. I’ve always that said what you do after achieving the dream is what the Olympics is is all about. To me, that is to bring change to the way Olympic athletes are supported. I had great luck and success internationally, becoming the first athlete chairman elected to represent athletes on the board of directors of the World Sailing Federation. On my opening remarks in 2008, I asked everyone around me if they were there for the 5 star hotels, or for the betterment of the sport. The King, who is also on the board, had a drink with me afterwards and said thank you for the speech. But I never got involved to meet the president, the royal family, or billionaires. I was there with an agenda to improve athlete rights and support. We made great progress, from returning windsurfing back into the olympic program, to being featured in the 2014 Olympics as best practices by the IOC on athlete rights. I was tremendously proud, but not complete. The hardest place to change, was back home in the United States. Nearly 4 years ago, while sitting at a council meeting with the USOC Athletes Council, tired of seeing inaction in committee conversations, I performed an action under Robinson Rule. in the section: Other Business, I called to order 3 motions. To review and investigate the USOC financials, determine the ability to improve US Olympic athletes rights and the possibility of a league minimum for the USA’s best Olympic athletes. These motions passed unanimously. 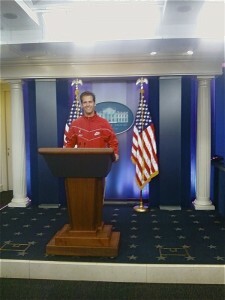 In doing so, I gained unparalleled access into the US Olympic institution. 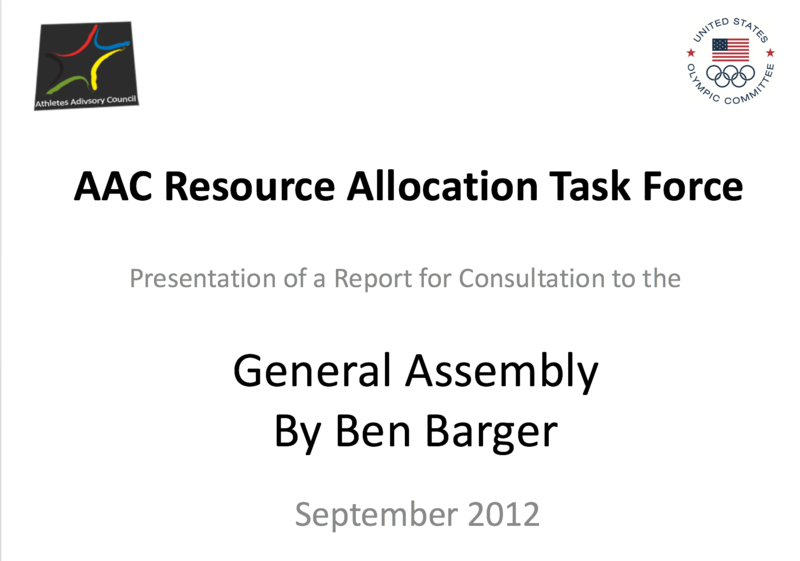 The USOC executive sent me hundreds of pages of board minutes, presentations and financials. For nearly 6 months, I prepared the presentation of my lifetime, to be given at the General Assembly of the USOC occurring only once every 4 years. During the presentation the investigation was met with hours of debate, amongst the very heads of the US Olympic Committee. Imagine debating with the CEO of Xerox, the Chairman of EA Sports and the CEO of the USOC on how to better support the Olympic movement. But it came at a price, not many people liked what I said, but they respected what I said. It was a healthy debate built on data. 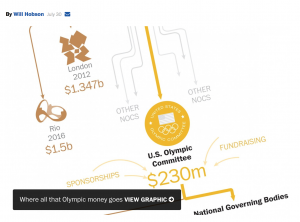 The resounding fact is just 6% of all USOC expenses goes to direct support of US Olympic athletes. I finally learned why I had to raise nearly a million dollars to compete against the worlds best, because someone else was spending the couple hundred million a year and it wasn’t the athletes. But just as often happens in governance when confronted with change that could effect yourself, the issue was attempted to be tossed aside. However, there is something I learned while competing and being in high level positions. Don’t give up on the “No”, not if they have graduated from the #1 School in the world, or have a billion dollars to their name. Influence happens when you have people behind you. That often means your onto something bigger than yourself. Many other athletes flooded my inbox post presentation with encouragement and I found out quickly I wasn’t alone. I had many conversations over the last few years with Senators in the commerce committee, the final oversight of the USOC. They all agreed change was needed, but nothing is illegal about not having a long term strategy. I knew that the next best chance for change was going into Rio, which starts next week. So I’m pushing more publicly this time. Our nations best athletes should not be in poverty, living off food stamps while executives get paid millions. It’s a not for profit, and it’s time for some public accountability. So I’m thrilled to share a Sunday front page Washington Post story that used many of the key findings of my presentation. The title: ”Olympic executives cash in on a ‘Movement’ that keeps athletes poor” by Will Hobson, a pulitzer prize winning columnist originally from the Tampa Bay Times. I encourage you to share this story, your a leader in our community, and every dream has a price and every athlete in this nation deserves to be better served. Thank you for your support over the years, we have made major impacts on hundreds of thousands of lives and I could not have served without you believing in me. Having just wrapped up two events in Miami last month, I wasn’t sure at the time if they would be my last ones. I had such a mixed bag of emotions after losing the last Olympic Trials as “captain crash” in 2011. But this time I was doing much better, within a few points of being the top American, and finally ending up third! I know how little I prepared for the events and I was super nervous, but surprisingly at age 34 I didn’t feel extra fatigued or really run down. Just out of practice. I was surprised at my performance and had some very good mark roundings in a very stacked fleet! It was probably the best vacation I’ve taken in years. I really missed competing. Although it would be fun to elicit revenge on my prior losses-that it keeps me up all night. But that’s not the case anymore, I already had years of that. Or that I need to retire at the top of my game to make my ego feel better. That’s not the case either. I’m only doing it because I love the sport, I love the feeling of improving, and the results that come from smart preparation and hard work. I know I have a great chance of making the Olympic Team for Rio,and so that is exciting too! I wouldn’t call this a comeback. Believe it or not I worked full time when I was competing for Beijing, and so this is more of the same, except I have much more responsibility at work. But it seems to inspire my staff! Olympic competition is a lifestyle. It’s a journey. I don’t want to bring up the trendy cliches. But if I was motivated by fear, by possession, by obsession. It only lasts so long until the flame burns out. That’s not the full circle experience with love in your heart. No other place in life, not work or any other, that challenges my skills like competition. It’s what has built my DNA. It helps me understand my emotions and how to better operate under pressure, and keep going when everyone else quits. It’s not designed to be sustainable, someone is always trying to outdo someone else. I’m not going to be building a big team this time, or spending tons of money to make this all work. I have won more competitions with no coach, with a bag on my back. I’m just doing it with my friends and family. I have exactly one year to the Olympic Trials. Tick Tock. Those two events are the Miami World Cup and an event in Mallorca in March 2016. It’s going to be a busy year!! 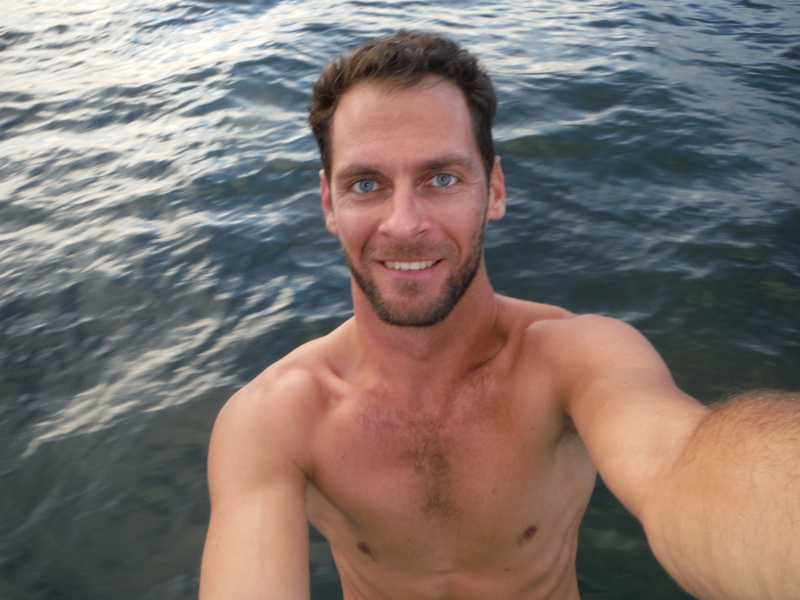 I wake up early now and go training on the rower and weights- about 30 minutes worth each morning. Then I hit work and put in atleast 9 hours of full on bliss. Usually one cup of coffee, sometimes two. I have a great team, great results and I love my role in change management in the nutrition industry. After work I go straight to the yacht club and jump in my wetsuit and go training for usually 90 minutes. I feel my body and technique improving each day. I can start to feel the muscles I used to use everyday comeback. It’s amazing how much memory is built into our rhythm. I invite any athlete that wants to train with me in St. Pete to come on out! I still have a few fast fins and masts from the last campaign. A board that with some more TLC will be good and I have purchased 3 new sails, a few masts, a new board, boom, and accessories. It’s been fun testing these new pieces of kit out! I love windsurfing. I love sailing. I love to compete because there is no other place in life that can truly test my skills. I love being an Olympian, representing our great country has been a highlight of my life. For the first time in three years, I will race at a few regatta’s this month. They are major qualifiers, but I don’t care about the results. I don’t care if I finish last or first. I’m doing it because I love the game- a game I missed as I’ve focused on my career. I’m doing it to stay fit at age 34. I like flexing in the mirror with cut abs. I like feeling the rush of the water underneath my feet as I bounce over the water at 30 knots. I’m doing it because I miss the camaraderie with all my competitors that travel the globe pursuing Olympic glory. I’m doing it because I know there is a chance I could race in the Rio Olympic Games in 2016.. That sure would be a treat. Your only as good as your last event- and it’s been since Dec 2011. Time to make some new memories, just for me. I’m a dreamer. Lifelong. There is something about having to prove yourself. Something crazy about challenging yourself when it’s so much easier to just be lazy. My hands burn as I type this, I’m sore everywhere after training with people half my age, and I’m smiling ear to ear. Winter training at it’s finest in Florida in the sunset after work. There is something about inspiring yourself that inspires others. I still feel 80K people screaming as the Americans enter the stadium to shouts of U-S-A. But no matter how great the memories, the best is yet to come. Let’s get back in the games. I can’t wait. It’s official. I’m training for the Olympics again. Goal #3: Stay inspired people! For two years since I lost the Olympic Trials in 2012, I clocked out. I just wanted to disappear. I had the worst year of my competitive life in 2012. But hell would have to freeze over before I’d let that be my last memory. After 20 years competing I needed a real break and some fresh air, but I never forgot about how much I loved windsurfing, I just couldn’t do it anymore. If you met me in the last 2 years, you didn’t know me. I’m not done yet. It takes a hunger to be competitive, a passion that can’t be encouraged by anyone else. While away, I did put my energies in work though, and it’s been good to me, taking me to Hong Kong last year with addias, and now in an executive role with a major nutrition company here stateside called Procera. I’ve found my strengths in change management positions. But let me tell you another reason I came back to Florida- so I could go sailing everyday. So I could train for Rio 2016. I wake up with the fire burning brightly again. It’s taken me a few months to get my heart rate back down, to put callouses on my hands and strengthen my back. But I will be ready for the national championship in Miami in January. The short term goal is to be US #1 there, win the Pan American Trials and be back on the US Sailing Team. I’m not joking. Besides my individual goal for Rio, the nut I still have to crack is to change the funding system of the US Olympic program. You might think I’m crazy, the USOC board already looked at me crazy. But if you know me, I don’t pack my bags and head home at the first sign of resistance. I know there are millions of US athletes that don’t get a lick of support from the US Olympic program, even if the funding is at the billion dollar level. When I launched the investigation in 2012 and presented my findings to the USOC General Assembly, I discovered only 6% actually gets to athletes in direct support. I’m not going to ask you for any personal support for me in the next few years going to Rio- no I have a great job. But I’m going to invest in foundations that actually support the athletes. Stay tuned for that announcement and how to support athletes around the US with big dreams that need our help. Life isn’t always an ice cream cone. It comes with hard times, hard knocks and has beat me down. The winning has come from major losses, challenging my talents on a regular basis to consistently improve. Too often my hearts been focused on selfish matters that don’t make any difference for society. But that’s not what I wake up everyday attempting. I want to be remembered, I want to make a real difference and use my passions to encourage others to achieve more with what they got. I’m an over achiever. I’m a normal guy with a big heart that doesn’t give up. Sport has been a world connector for me, a self discovery into being a better Ben. 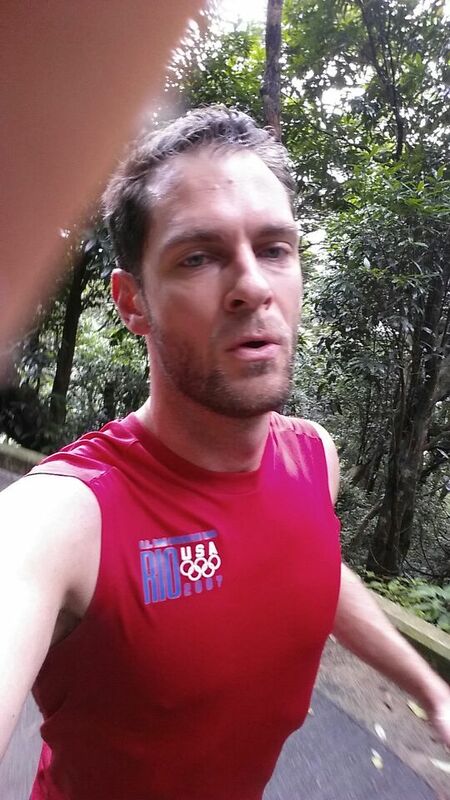 Since I raced at the Beijing Games in ’08 those were some excruciating years for me. First a divorce, then losing the Olympic trials. Then windsurfing being kicked out of the Olympic Program by Kitesurfing. I was at rock bottom. It was easy to look away bitter, to let the scars hold me back. But that’s not how winning is done. 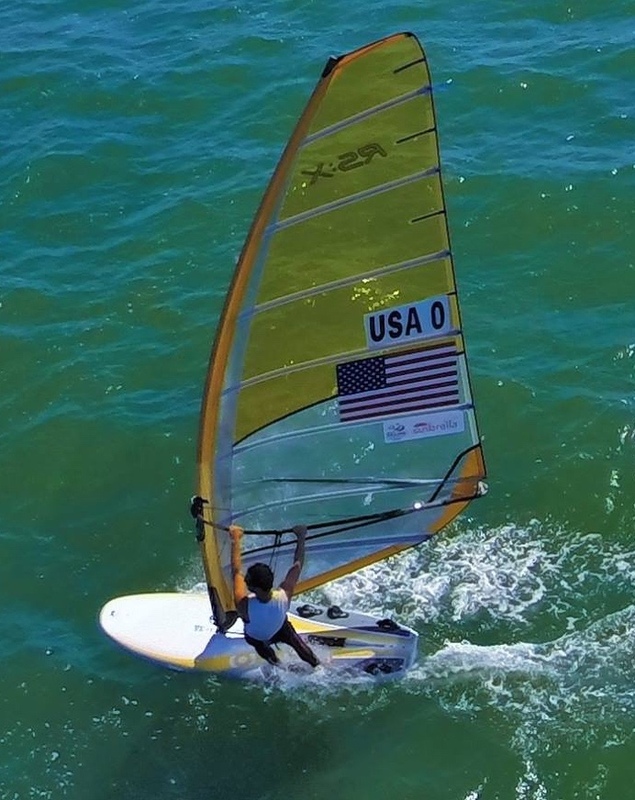 In the summer of 2012, while I wanted nothing to do with the Olympics, a vote on the board of directors removed windsurfing, one in which I had abstained. After working 7 years getting athletes the first ability to vote at the board level, I saw my sport disappear and I couldn’t say anything. I saw the King of Greece argue it was the right decision to replace it with kitesurfing. I couldn’t believe my eyes. Neither did a million other people. As a small group of us wrote speeches, challenged the vote with protests, and gathered an army of support, I found value well beyond my own interests. 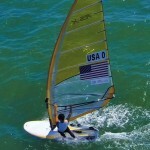 I saw kids like me that had their eyes set on competing at the Olympics in windsurfing. I had to fight. I was threatened, I was told I would be sued. But I won’t let anyone tell me that I can’t do the right thing. I know my efforts helped return the sport to the Olympic program- it was the first time in history that a reversal was made through the shareholders. If I don’t win a medal in Rio, I know I already won 6 for my beloved sport. But I’m not done yet- my fire is back. Stay hungry. Live your life with passion and purpose. I look forward to supporting the next generation of athletes-especially USA athletes. I’m home and I’m staying here this time. I love my country and how we look out for each other. I look forward to sharing with you the progress. Still sweating from a long workout (55 Minutes), I’m excited to announce the next few years I will proudly prepare & train to compete at the 2016 Olympic Games in Rio De Janeiro. I will also do this while working a full time job and post about all the excitement here on my blog–probably with selfies–like below. That way all my coworkers, competitors and friends can be entertained. It’s time to put on my game face and have some fun with my revenge for Rio -2016 campaign! It will also be a latin theme, so I need to learn how to dance Samba. Socially, I don’t think I’m cool enough to make a likable page on Facebook out of fear I won’t have enough likes, so I will just add you as my friend. Also the hash tagging phenomenon won’t work for me either, I like to train by feel and all these hashes get way to complicated. Instead I’ll post what my workouts have been, how many brownies I ate to recover, etc. Core metrics. But seriously, when I left racing a few years ago, It was time to focus exclusively on my career because I was too upset to touch my windsurfer after a terrifying 2011-2012 season. After finishing #2 at the US Olympic trials in 2012 to the-awesome-high-speed-competitor Bob Willis, I instead immediately stepped up my efforts for athlete rights- both in the USA and Internationally, largely because I was tired of athletes getting screwed up and left behind by a lot of older “guard” in Olympic leadership positions that were very convinced the way they’ve done it 50 years ago was the way it still should be done. 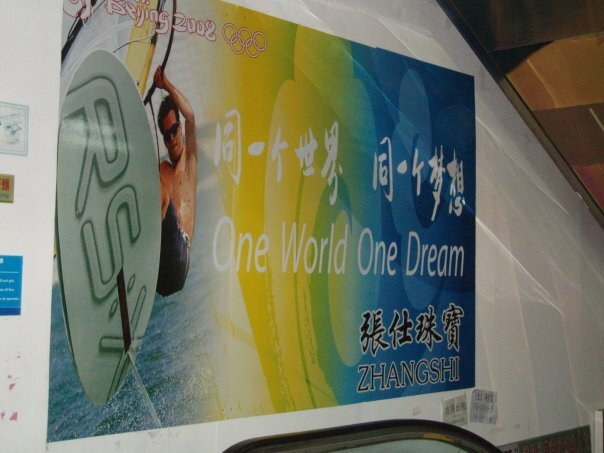 Fortunately I had thousands of upset athletes that were an honor to represent and with their help made some great reform, including getting my sport windsurfing, returned to the Olympic program after being rudely removed. The IOC and the US Senate also liked some of my work which was very nice of them! But my main focus since London 2012 has been on my career track and most recently I was in an executive management role for adidas badminton, leading a major restructuring, and living in Hong Kong. I really love Hong Kong, everybody should live here once, it’s such a fast paced culture with braniacs everywhere! But professional success, as fortunate as I’ve been recently- I have woken up with some unfinished business. There is a mountain peak some 1500 feet high -called Victoria’s Peak-that while living in Hong Kong I looked at everyday from my window watching tourists take a tram to the top. Naturally resisting mass transportation in China -because everybody sweats & smells on you- I found myself running up the Peak 3-4 times a week to get the nice view myself. At first my lungs burned like never before (it wasn’t the smog), and then later I joined the gym and started rowing, noticing my fitness was not far off my old pace…uhhh ohhh. Comeback? I’ll keep my program pretty simple and focussed this time around. I won’t quit my job and that will save a lot of money which can buy lot’s of fast equipment. The Miami World Cup in January 2015 is my main focus to get back on the US national team. Then the following year in 2016 is to win the US Olympic Trials and prepare for the Olympic Games In Rio De Janeiro, Brasilia. 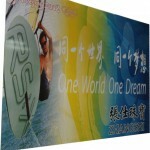 Windsurfing is BACK in the Olympics!!!!!!!!! Don’t let others tell you it’s ever impossible. Sometimes you might just change history. I know I did. I will never forget this year for the rest of my life. Thank you all for your support and courage. We did it together. So I spent the 6 months between May and November, reading regulations, articles of the constitution, consulting lawyers, and the world population to find a way to get a fair vote for windsurfing. I felt like I had a course on corporate law. On what structures were right for making good decisions, and how I was not going to let ISAF say everything was fine with the May decision to remove windsurfing from the Olympic program of events. US Olympic Program- We can do better! I’m a founding member of a task force that’s part of the USOC Athletes Council and I’ve spearheaded an investigation of the USOC resources allocation practices. My investigation was going after a board policy from the USOC that only funds those that are current and likely to potentially medal. If you aren’t already proven to have top ten results internationally you won’t get the funding. Actually you get nothing. No wonder so many athlete are going bankrupt and having such financial difficulties. Check out the “A Tempting World” Program! Selected as the only US Olympian to rotate between four companies and share the excitement and capability of Olympic athletes in the workplace. The rotations were blogged and video documented for marketing and PR use by Adecco, a world sponsor of the Olympic Games. Companies included: Four Roses Bourbon, Ketchum PR, Security Point Media, and Laser Spine Institute. Now this may sound kind of grand, but I believe if you truly believe in something strong enough, you can change the world. But this time my world was changed. Windsurfing is no longer part of the Olympics. In May this year, at the board meeting I was a member at in Stresa, Italy, I lost my sport. I sat there and watched countries (like my own) and their Board representatives, vote and speak about what was in their best interest to win medals- not what was best for the sport as a whole. I was appalled. I was disgusted. I secretly took a list of those members that I know were not practicing their fiduciary duty, including many of the leaders of ISAF. It is time to take a stand- who else would? I am an elected official and I have a duty to act. Since finishing second place in the US Olympic Trials, I have to admit it’s been a tough swallow. I don’t lose very well, I don’t like to complain either. But one of the big challenges I always faced was raising hundreds of thousands a year while competing full-time. It was and will probably always be the hardest thing I have ever done. I’ve been fortunate to make it as far as I have come: US #1 for 7 years, 2008 Olympic Team and 2X alternate. All things have never been equal, winning budgets internationally for winning medals are 500K plus per year, and through long and hard work I’ve typically outperformed those with 3-4 times my annual budget. So I will spend a good portion of my time this year focusing on redeveloping the US Olympic funding system as well as continuing to pioneer athletes rights internationally. I know most athletes don’t want to talk about how much they have had to suffer to make their dreams come true, but I will start to share with you and the world what makes a US Olympian do truly remarkable feats to make it and what I hope to change to best support the next rising stars. I’ve spent the last 5 years or so getting elected to leadership positions, I chair the Athletes Commission of the International Sailing Federation and have secured the first ever Board of Directors position for athletes, representing 10K plus athletes around the world. I’m also on the USOC Athletes Advisory Council which I’ve co-founded the resource allocation task force to address USA specific funding concerns and direction. This year I will use those positions to the best of my capacity to make lasting change to the Olympic movement.